These Pachinko Balls are for Pachinko machines and are imported from Japaneses Pachinko Parlors. These are NOT just Ball Bearings bit are the genuiine stanless steel pachinko balls that will never rust or jam your machines like the imposters will. They are shiny and clean and have many other uses as well such as filling a decorator vase or ceramic bowl, bottom of fish tanks. Pachinko Balls that are Used but clean imported from Japanese Pachinko Parlors. There are different various engravings of Pachinko Parlor markings. 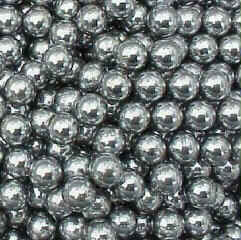 They are 11mm in diameter.Packed 500 pachinko balls in a bag. These are guaranteed to work in your machine and will not rust.